With so much changing all around us in the busy modern world, on Thanksgiving we feel glad for the things that stay constant—family, friends, and the small comforts of home. There is much to appreciate in the random things, as well. Instead of trying to plan everything in detail and then getting stressed when it doesn’t all work out, sometimes we do better just to go with the flow and discover what comes along. Two years ago, I wanted to buy an angel for the top of my family’s Christmas tree. We had been putting different ornaments at the top each year—a star, a dove, a sun—but we never had an old-fashioned angel. I looked at several stores, getting frustrated when I couldn’t find what I had in mind. 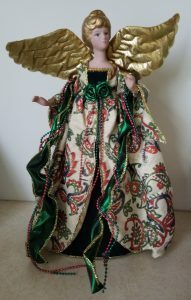 When I browsed online, I gave up after wading through many pages of angel ornaments that just didn’t look right. She’ll make a lovely addition to the Christmas tree when we set it up this weekend! And in the spirit of the season, another random thing I came across last week is a blog with a random acts of kindness generator that suggests good deeds for the day. The more kindness there is to go around, the merrier! Wow Meg, it’s so pretty and peaceful, great find, sometimes what we need is exactly in our hands and we don’t see it.